Finally — some good news for the bees of Hawaii. The U.S. Fish and Wildlife Service has given endangered status to seven species of yellow-faced bees native to the islands. These are "the first bees in the country to be protected under the Endangered Species Act," according to the Xerces Society, which advocated for the new designation. The new rule designating protections for the bees, published Friday in the Federal Register, states that yellow-faced bees are known "for their yellow-to-white facial markings." They look like small wasps, according to the rule, except for their "plumose [branched] hairs on the body that are longest on the sides of the thorax, which readily distinguish them from wasps." 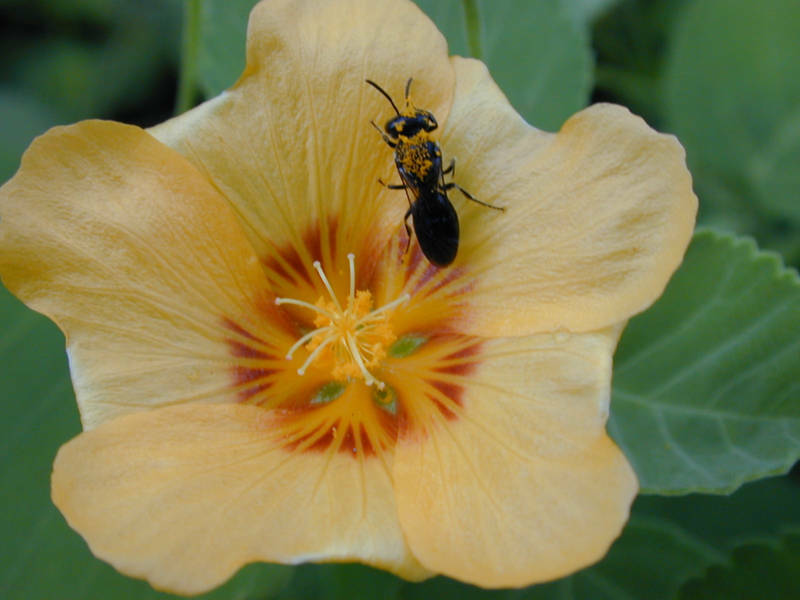 The yellow-faced bee is the only bee native to Hawaii, meaning that it was able to reach the Hawaiian islands on its own, according to a fact sheet provided by the University of Hawai'i's Master Gardner Program. "From that one original colonist they evolved into 63 known endemic species, about 10% of the world's yellow-faced bees and more than are found in this genus in all of North America." But the populations of these seven species are getting smaller and smaller, according to Fish and Wildlife. For example, the Hylaeus anthracinus was once found in dozens of locations around Hawaii but is now in only 15 — while Hylaeus hilaris and Hylaeus kuakea are each found only in one location. The seven endangered species are impacted by a wide variety of threats, including habitat destruction because of urbanization or nonnative animals, the introduction of nonnative plant species, wildfires, nonnative predators and natural events such as hurricanes, tsunamis and drought. The protected status "will allow authorities to implement recovery programs, access funding and limit their harm from outside sources," as Gregory Koob of the Fish and Wildlife Service told The Associated Press. He added that "all federal agencies must consult with the Fish and Wildlife service when interacting with endangered species." The Xerces Society called the new rule "excellent news" but added that "there is much work that needs to be done to ensure that Hawaii's bees thrive." "These bees are often found in small patches of habitat hemmed in by agricultural land or developments," the group said. "Unfortunately, the [Fish and Wildlife Service] has not designated any 'critical habitat' areas of land of particular importance for the endangered bees." As we've reported, pollinators are under threat around the world. A U.N.-sponsored report released in February found that "about 40 percent of invertebrate pollinator species (such as bees and butterflies) are facing extinction." This could have major implications for world food supply, because "about 75 percent of the world's food crops ... depend at least partly on pollination." Despite the threats, the University of Hawaii says these bees "have managed to persist with amazing tenacity." While this group of species is now endangered, new species of the genus are discovered regularly – "11 new native species have been found in the past 15 years." The rule, which goes into effect at the end of the month, also gives the endangered designation to 39 plant species found on the islands and to three other animals native to Hawaii – the band-rumped storm-petrel, the orangeblack Hawaiian damselfly, and the anchialine pool shrimp. The anchialine pool shrimp is known for its unusual longevity — according to the Hawaii Nature Journal, they can live for 10 to 15 years in the wild.